On Friday, October 21, at 7:30 am local time (10:30 UT), Arianespace successfully launched the first Soyuz rocket from the Guiana Space Center (CSG) in French Guiana, orbiting the first two satellites in the Galileo constellation. This historic launch signals the advent of the world's broadest range of commercial launch services, and will ensure Europe's independence in satellite positioning and navigation services. 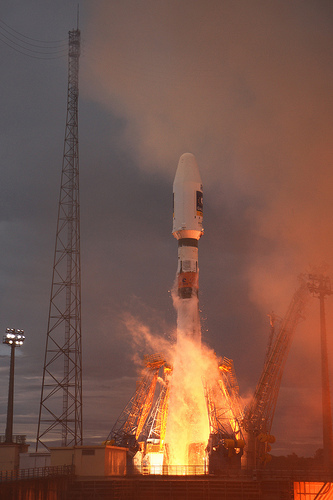 The "Soyuz at CSG" program carries on the partnership between Europe and Russia that started in 1996 with the creation of the Starsem joint venture to operate Soyuz commercial launches from the Baikonur Cosmodrome in Kazakhstan. It gives Europe access to a proven medium launch vehicle, while allowing Russia to increase its annual production of Soyuz launchers. With Ariane 5, Soyuz and shortly the Vega light launcher, Arianespace is the only launch services company in the world capable of launching all types of payloads to all orbits, including communications, scientific and Earth observation satellites, constellations, cargo missions to the International Space Station and more. Following the work performed on the Soyuz launch facility and the associated additional checks, Arianespace has decided to restart the countdown operations for the launch VS01, Soyuz STB – Galileo IOV-1. The launch of Europe’s first Galileo navigation satellites on Russia’s first Soyuz rocket to depart from Europe’s Spaceport in French Guiana is on schedule. Liftoff is scheduled for Thursday, 20 October at 12:34 CEST (10:34 GMT, 06:34 EST time). Streaming video begins an hour before launch. The launch will be the first time that Russia’s venerable Soyuz vehicle has ascended from European territory, adding a trusted workhorse to Europe’s launchers family. This Soyuz-2 version is the latest in the renowned family of Russian rockets that began the space race more than 50 years ago by carrying both the first satellite, Sputnik, and the first man, Yuri Gagarin, into space. Riding Soyuz will be the first two operational satellites in the Galileo constellation that will provide Europe with an independent global satellite navigation system.